The Race Was really nice! For one, I love Moab, it has got to be my favorite place to visit and two, we ran along the river and it was beautiful scenery! The weather was warm (almost too hot during the marathon- 80 degrees) and there was good Company..
We got to see a lot of people! Boonie and Carl, Cea and Kev and their beautiful Kani and also Desiree and Marc came to watch. It was a lot of fun. Boonie is as always wonderful to be around. 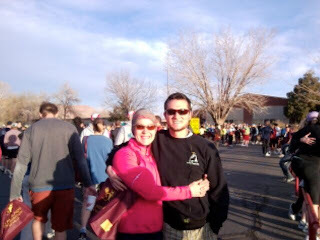 Here we are, Before the Race- it was kinda cold before we started... Not to be fooled! I am so glad that we got to do a lot in the desert. 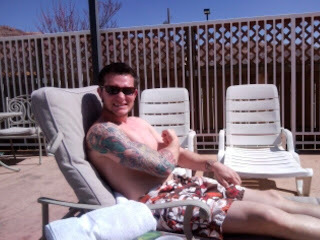 After the race, we were lazy by the pool in the nice weather. Then we went climbing on wall street - That was fun! And then we ventured to Goblin Valley State Park. If you have never been here you really must go. We hiked a 9 miles loop from Little Wild Horse Canyon down into Bell Canyon. These were amazing slot canyons, they were really just incredible. Lyle and I kept talking about how vulnerable and insignificant you feel when in the desert, but at the same time how serene and at peace you feel. I am so glad that we did the whole 9 miles, It was a nice hike. But don't worry, you can still visit the slots if you have children because you don't have to do the loop. Camping was nice although the weather turned a bit cold, and windy. hehe, we would wake up- all covered in sand from the windy nights... It was funny. Goblin Valley was interesting, and it made Lyle turn into a little kid again. He kept talking about wars and battles that could be had and what goblins were in charge and where they all lived. It was pretty cute. Here are more desert pics. These trees were incredible, I have never seen bark so thick and aged and resonant. Umm, I had no idea the race was this early! I am so sorry- I didn't even wish you guys luck! I am so proud of you guys for running that. Congratulations on finishing! That truly is amazing. What is even more amazing is that you guys did a 9 mile hike after you ran a marathon. What are you guys? You can't be human. I can just hear Lyle going off on the goblin battles. I love it. I have to agree with Mccall's comment...How the hell did you run and then hike...crazy! 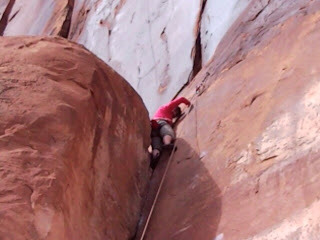 I have never been to Moab or Goblin Valley..these pics make me realize that I really need to go! !